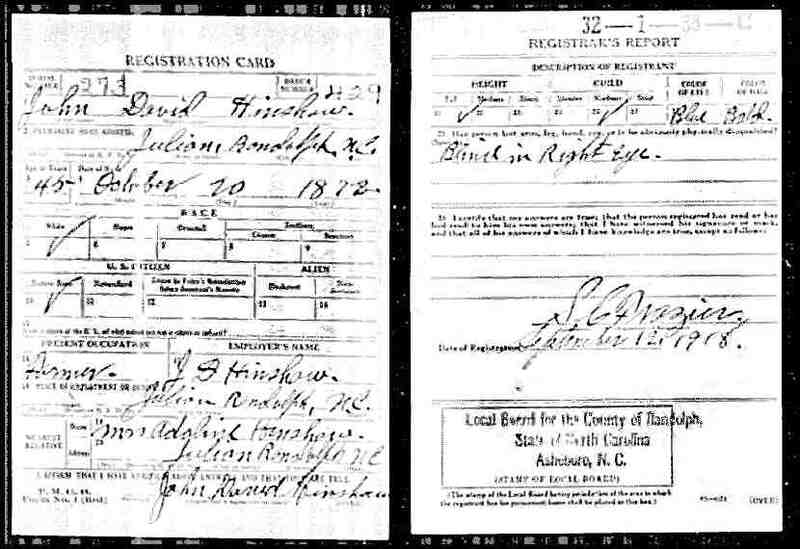 Hinshaw, John D., head-of-household, age 27, born Oct 1872 in North Carolina; parents born in North Carolina; married 4 years; occupation: farmer; rented farm. Hinshaw, Adeline, wife, age 24, born Nov 1875 in North Carolina; parents born in North Carolina; married 4 years; 2 children, 2 living. Hinshaw, Carl, son, age 3, born Jan 1897 in North Carolina; parents born in North Carolina. Hinshaw, Gracy, daughter, age 1 month, born Apr 1899 [sic] in North Carolina; parents born in North Carolina. Hinshaw, John D., head-of-household, age 36, born in North Carolina; parents born in North Carolina; first marriage, married 14 years; occupation: farmer, general farm; owned farm (free). Hinshaw, Emma A., wife, age 34, born in North Carolina; parents born in North Carolina; first marriage, married 14 years; 4 children, 4 living. Hinshaw, Carl, son, age 13, born in North Carolina; parents born in North Carolina; occupation: farm laborer, home farm; attended school. Hinshaw, Grace, daughter, age 10, born in North Carolina; parents born in North Carolina; attended school. Hinshaw, Max, son, age 7, born in North Carolina; parents born in North Carolina; attended school. Hinshaw, Ellen, mother, age 68, born in North Carolina; parents born in North Carolina; widow; 6 children, 6 living. Hinshaw, John D., head-of-household, age 47, born in North Carolina; parents born in North Carolina; owned home; occupation: farmer, general farm. Hinshaw, Emma, wife, age 44, born in North Carolina; parents born in North Carolina. Hinshaw, James, son, age 18, born in North Carolina; parents born in North Carolina; occupation: farm laborer, working out. 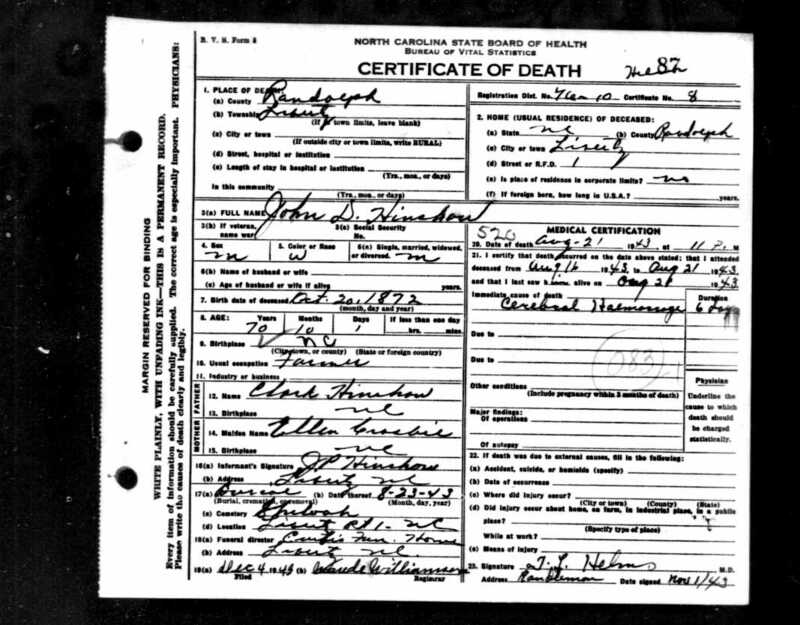 Hinshaw, Max [unclear], son, age 16, born in North Carolina; parents born in North Carolina; attended school. Hinshaw, Pearl, daughter, age 5, born in North Carolina; parents born in North Carolina. Hinshaw, John D., head-of-household, age 57, born in North Carolina; parents born in North Carolina; first married at age 22; owned home; no radio in home; occupation: farmer, general farm; not a veteran. Hinshaw, Addie, wife, age 54, born in North Carolina; parents born in North Carolina; first married at age 19. 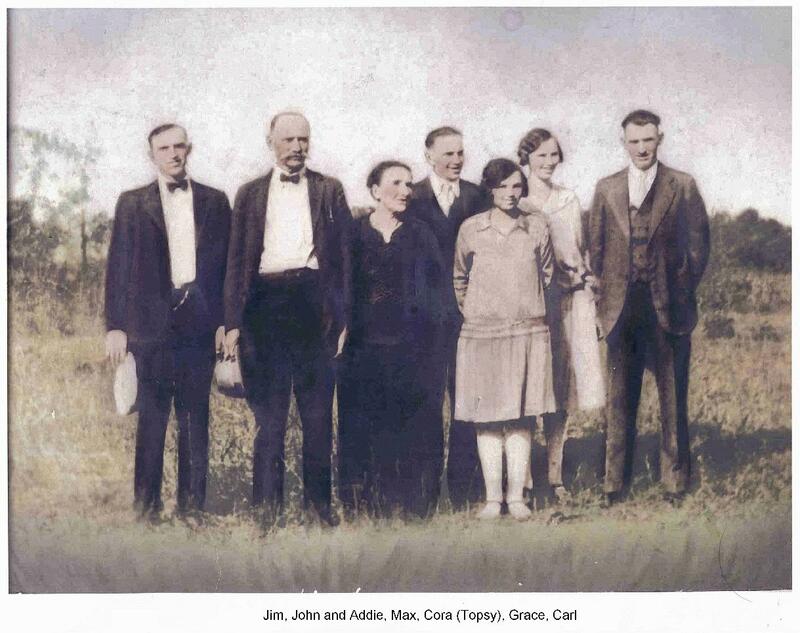 Hinshaw, Cora, daughter, age 15, born in North Carolina; parents born in North Carolina; attended school. Jordan, Frank F., father-in-law, age 93, born in North Carolina; parents born in North Carolina; widower; first married at age 21. Hinshaw, John, head-of-household, age 67, born in North Carolina; completed 6th grade; on Apr 1 1935 was living in the same house; owned farm ($400 value); occupation: farmer, farm. Hinshaw, Addie, wife, age 64, born in North Carolina; completed 6th grade; on Apr 1 1935 was living in the same house. Addie's obituary was published in the "High Point Enterprise" (High Point, North Carolina) on Thursday, Aug 5 197625 (see scan below). 1900 census, Jefferson Township, Guilford County, North Carolina; roll T623-1198, ED 62, page 10B, line #55, dwelling #159, family #159. 1910 census, Liberty Township, Randolph County, North Carolina; roll T624-1128, ED 88, page 169B, line #51, dwelling #209, family #209. Obituary of James P. Hinshaw. 1920 census, Liberty Township, Randolph County, North Carolina; roll T625-1318, ED 108, page 17B-18A, line #99, dwelling #343, family #345. 1930 census, Liberty Township, Randolph County, North Carolina; roll T626-1715, ED 19, page 19A, line #13, dwelling #358, family #364. 1880 census, Liberty Township, Randolph County, North Carolina; roll T9-978, ED 212, page 49D, line #31, dwelling #199, family #199. 1940 census, Liberty Township, Randolph County, North Carolina; roll T627-2962, ED 76-22, page 13B, line #58, household #220. 1910 census, Liberty Township, Randolph County, North Carolina; roll T624-1128, ED 88, page 169B, line #62, dwelling #211, family #211. 1920 census, Liberty Township, Randolph County, North Carolina; roll T625-1318, ED 108, page 17B, line #92, dwelling #342, family #344. 1920 census, Liberty Township, Randolph County, North Carolina; roll T625-1318, ED 108, page 18A, line #4, dwelling #344, family #346. 1920 census, Liberty Township, Randolph County, North Carolina; roll T625-1318, ED 108, page 18A, line #7, dwelling #345, family #347. 1930 census, Liberty Township, Randolph County, North Carolina; roll T626-1715, ED 19, page 19A, line #17, dwelling #359, family #365. 1930 census, Liberty Township, Randolph County, North Carolina; roll T626-1715, ED 19, page 19A, line #20, dwelling #360, family #366. Contribution from Richard Alan Wood, citing: gravestone. Contribution from Richard A. Wood (). "High Point Enterprise", Aug 5 1976; http://www.ancestry.com. Photo courtesy of Richard Alan Wood.